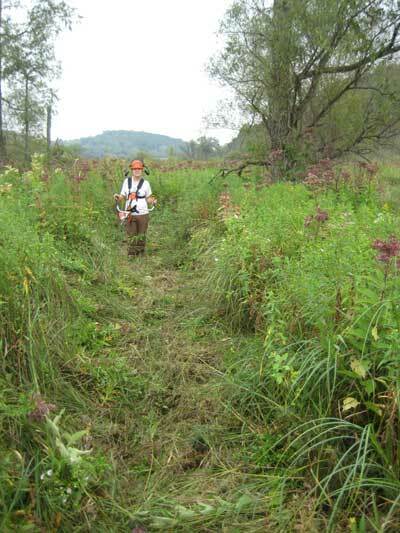 I recently found time to update the list I had prepared some years ago of plant species that were already present at Pleasant Valley Conservancy before we began restoration. Most of this information is already on our web site, under the page entitled "Increasing species diversity", but in somewhat fragmentary form. We were fortunate that two skilled botanists, Brian Pruka and Paul West, had made species lists before we began restoration. Later, Kathie made a list of the species present in the small ungrazed and unplowed remnant (Unit 1, also called "Kathie's Prairie"!). Finally, I made a list of species that had been overlooked by the others, including those in remnants existing at the east end of the Conservancy. 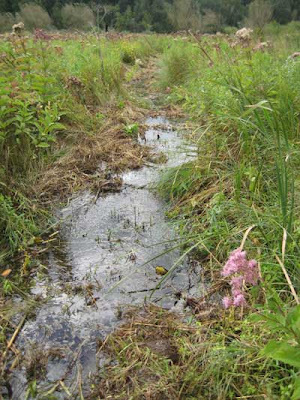 These latter included the unplowed north side of Toby's Prairie, which has a substantial population of Baptisia alba as well as milkwort and cynthia. Also, the unplowed remnant that we called Toby's Annex, at the east end of Toby's Prairie, which had our native population of showy goldenrod, flowering spurge, Missouri goldenrod, round-headed bush clover, and hawkweed. Further, there were quite a few native species on the north-facing road cut along County Highway F. Also, there were quite a few woodland and wetland species. Finally, I added species that were discovered after restoration was underway but we knew had never been planted, such as prairie turnip. 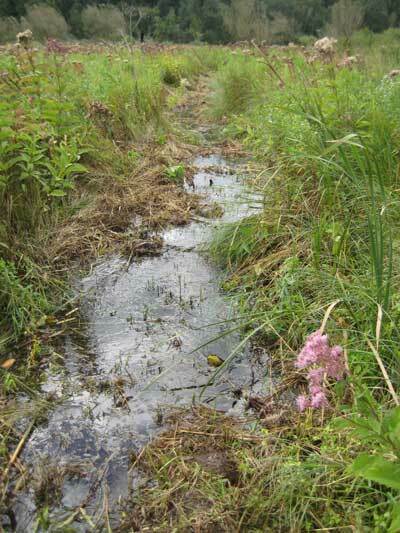 Some of the species that had not been recorded by Pruka or West were spring flowering plants or wetland species. Others were located at remote parts of the property and were never visited. 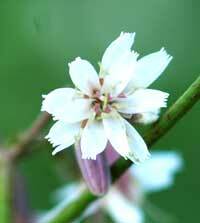 Others were early spring-flowering species that had senesced before their summer visits. And others were just missed. The final list, which is too long to post in this blog, contains 307 species. I hope to post it on our web site sometime soon. This is a useful list, since it gives an idea of the kinds of species that are able to maintain themselves without any help. It gives one encouragement to proceed with restoration work on other degraded sites. Although lengthy, the list is certainly not complete. A final point: Although the diversity is surprisingly high, many of these species were only present in small numbers, or at only a single site. For instance, Indian grass, which is now widespread at Pleasant Valley, was only present at a single small remnant (Unit 4). There was enough there to serve as the foundation for all the Indian grass we have eventually planted, but we had to build it up gradually. We have recently been able to confirm that we have a number of specimens of Hill's oak (Quercus ellipsoidalis), also known as northern pin oak or jack oak, at Pleasant Valley Conservancy. 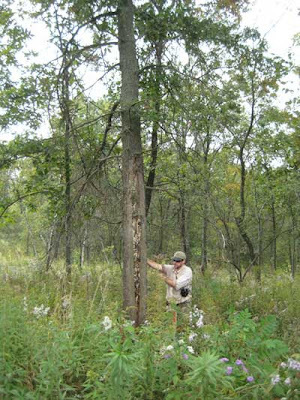 This species is an upland and northern version of pin oak (Q. palustris), and is an endemic in the upper Midwest (see Curtis, Vegetation of Wisconsin for background on this and the other Wisconsin oaks). The recent paper by Hipp and Weber (Taxonomy of Hill's oak: Evidence from AFLP data; Systematic Botany, 2008, Volume 33 no. 1, pp. 148-158) provides a nice summary, including a map of its distribution. Hill's oak is a member of the black oak section, and was originally identified as scarlet oak (Q. coccinea) (see Voss, Michigan Flora, for a lengthy discussion). 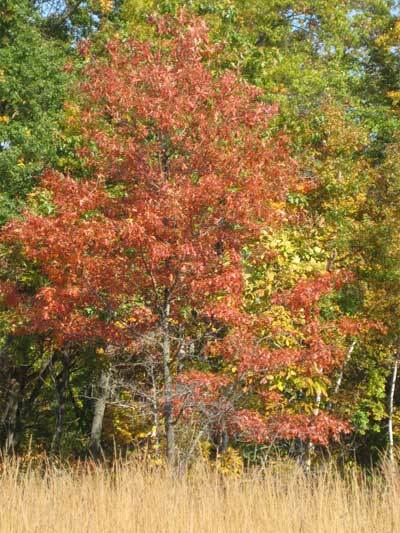 The Hipp and Weber work provides firm data that Hill's oak is a distinct species. According to Curtis, this is the most xeric species in the black oak group. It is predominantly a tree of dry, sandy places, and extensive pure stands are only found in Wisconsin in such sites. Curtis states that it is the most shade intolerant of all the Wisconsin oaks and cannot reproduce under the shade of any other tree species. 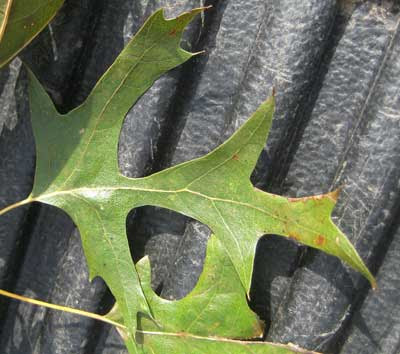 There are several characteristics that have been used to distinguish Hill’s oak: 1) Deeply lobed leaves with C-shaped sinuses (the sinus is the large opening in the leaf; see photo nearby). There are usually one or two deeply incised lobes (cut about one-half distance toward mid-rip of leaf. The leaves have sharp bristle tips like those of black and red oaks; 2) Acorns are ellipsoid often with longitudinal stripes, the cups enclosing one-third to one-half of the nut. The inner surface of the cup is much less hairy than that of black oak. The first recognition of Hill's oak at Pleasant Valley Conservancy was by Amanda during her work on the tree database. Her identification was recently confirmed by Scott Taylor, an independent consulting forester. Identification is a little tricky, as Hill's, black (Q. velutina), and red (Q. rubra) oaks are fairly similar, and in fact are known to hybridize. Although we have just begun to sort out which trees in our database are Hill's, we have identified several locations where they can be found. Our first "good" tree (shown in the photo with Scott) is in Unit 12A (the White Oak Savanna). It turns out that there is a small "grove" of Hill's oak at the eastern end of the unit, not too far from the steep ravine. Once this group was found we started looking uphill for an acorn source and found more Hill's at the east end of Toby's Prairie (on both the north and south sides) and in the area we call the Triangle (Unit 13D), which is also an area where we have red oaks as well. I spent several hours yesterday cruising likely areas and found quite a few identifiable Hill's oaks. I found that the leaf structure was a good basis for identification. I used binoculars to check the structure. Because of the deeply incised sinuses (shown on the photo), the leaves look fairly "skinny" when viewed on the tree. Obviously, we will now have to make some major corrections to our tree database, since all of the Hill's oaks were designated as black oaks. Sunday we had a nice visit from members of the Vassar Club of Wisconsin (Kathie is Vassar '60). This was an interesting group, since there was a wide distribution of ages. Also, although Vassar was traditionally known as a women's college, it has been coeducational (and successfully so) since the mid 1970s. Thus the group (including spouses) had a significant male contingent. 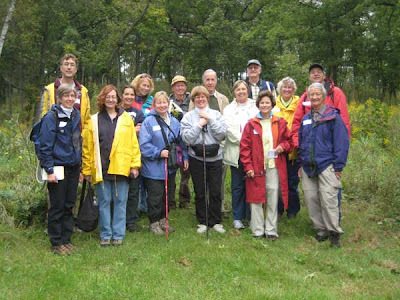 The whole program was organized by Martha Frey (Vassar '82), who is Membership Director of the Natural Heritage Land Trust, a Dane County organization that is a leader in natural area protection in our area. These were intrepid hikers, and they did the long loop, including a finish across the diagonal trail that crosses the middle of the south-facing slope. A significant number of the participants were knowledgeable about prairie restoration, either from their own properties, or from friends or colleagues. After the hike, the whole group had lunch (Sunday dinner, really) at Luckenbooth's Cafe in Black Earth. Yesterday I spent an hour or so collecting woodland Joe Pye weed (Eupatorium purpureum). 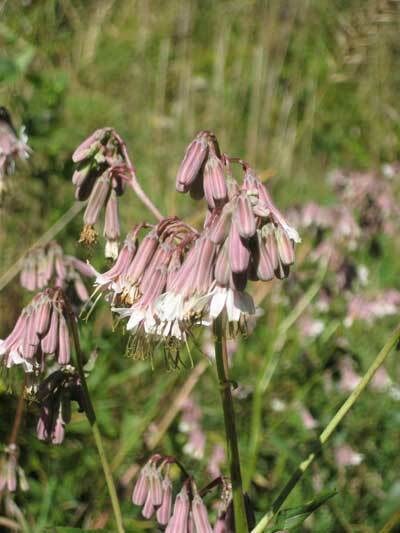 This species is relatively similar to the wetland Joe Pye weed (E. maculatum), but less colorful and better adapted to woodland areas. It is a strikingly tall species that has become established in those parts of our savannas which have more closed canopy (50% or even a bit more). The best stands of E. purpureum are north of our North Fire Break, just before the steep drop off into the oak woodland. I used the Kawasaki Mule to get in there, and it was an enjoyable day, quiet and peaceful. I got two buckets full of seed heads. Although the flower heads seem fairly dry, they still need to be dried a few days by spreading them out on a tarp. Once dry, the seeds must be cleaned before using. It is fairly easy to clean the seeds. Just put the flower heads on top of a piece of fairly course screening (available from a hardware store) and scrape them back and forth. The seeds fall through, and the empty stems can be thrown away. Store the seeds in a dry place in a grocery bag until time to plant. While I was seed collecting, I was also keeping my eye out for small buckthorn that needed spritzing or basal barking. Fortunately, the buckthorns were fairly scattered here, and I proably only treated a couple dozen plants. I carried a spray bottle in my belt pack. 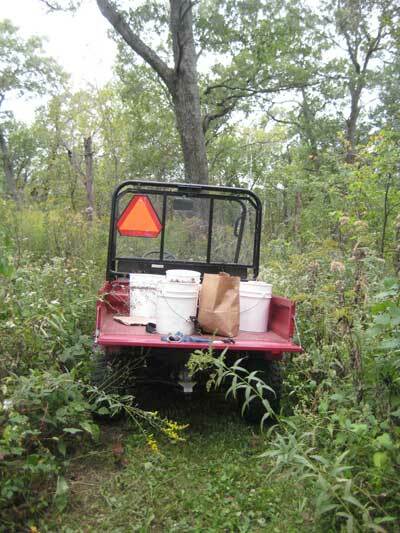 We'll be back in this area in the winter for more extensive buckthorn work. Hopefully, this will be a low snow year so that we can get some work done! Lion's foot (Prenanthes alba) is a nice savanna species that pops up in unpredictable places. 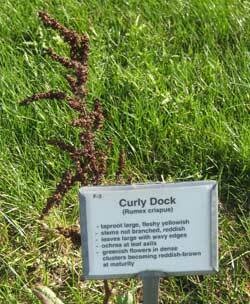 Other common names are white lettuce, or rattlesnake root. It is monocarpic, which means that after the plant flowers it dies. The next generation has to arise from seeds, and the plants may grow for several years vegetatively before flowering. It is not as rare as the other members of the genus (aspera, crepidinia, and racemosa), but it is an attractive and somewhat elusive plant. This year, probably because of the frequent rains, we have been finding it in almost all of our savanna areas. I haven't had time to go back over my field notes, but I suspect it is present in every one of our savanna units. I have never seen it in any of our prairies, although according to Cochrane and Iltis it can be found there also. It is a little late in the season, but any one doing restoration work will find useful the Weed Garden at the UW Experiment Station at Arlington, Wisconsin. I usually try to visit this useful installation at least once a year, as it is a valuable tool for natural area management. 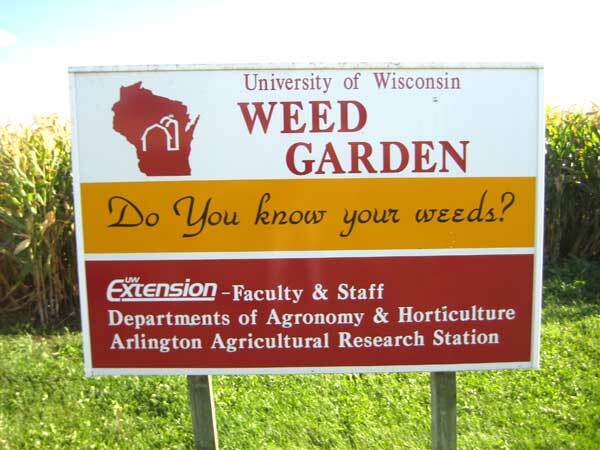 I'm not sure of the history of the Weed Garden, but I know that UW Extension Weed Specialist Jerry Doll managed this every year, and since his retirement, his replacement Mark Renz has been in charge. It must be fairly time consuming to set up, and since no one can fall in love with the plants on display, it may be a thankless job. However, here are my thanks! The Weed Garden is adjacent to the parking lot for the Events Building at the Arlington Experiment Station. 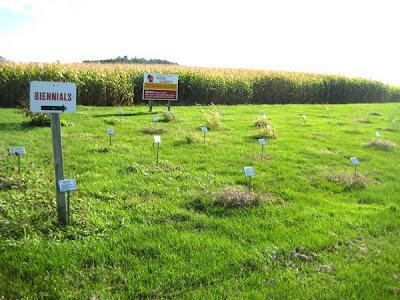 You can Google Maps at Arlington Agricultural Research Station, N695 Hopkins Road, Arlington WI 53911. The best way to reach the site is to drive north from Madison on U.S. 51 until you reach Dane County Highway DM. Go left for about a mile to Hopkins Road and then north until you reach the experiment station buildings. Pull into to the parking area for the Events Building. The Weed Garden is just south of the parking area. Look for the big sign (photo above). The Weed Garden has dozens of species. They are organized in groups: Perennials, Biennials, Annual Grasses, Annual Broadleaves. The largest number are the annuals, which are of course mainly of agricultural interest. But there are lots of perennials that we need to worry about in our restoration work. As the photo to the left shows, each weed is marked with an informative sign, giving details of identification and significance. What I find most useful is the information about whether a weed is perennial or biennial. For instance, I had always thought dame's rocket was a biennial (like garlic mustard), whereas it is included with the perennials. In fact, there are surprisingly few biennials listed. Here is the list: wild carrot, teasel, three thistles (but not Canada, which is a perennial), garlic mustard, mullein, wild parsnip, spotted knapweed (which I thought was a perennial), and burdock. Our wetland and the dam beavers! The spring burn that the U.S. Fish & Wildlife Service carried out on the wetland in our area (only part of which is owned by Pleasant Valley Conservancy) had dramatic consequences. The wetland flora is fantastic this year, with greater population densities, and lots more plants of desirable species. Particularly nice this year have been swamp thistle, swamp milkweed, turtlehead, Joe pye-weed, sweet Indian plantain, Michigan (Turk's cap) lily, boneset, and lousewort. Lots more purple-stemmed aster than usual (this is an aster that grows with its "feet" in the water). 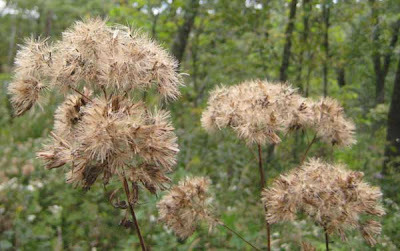 Flat-top aster, a desirable "fen" species, has returned in droves after several off years. 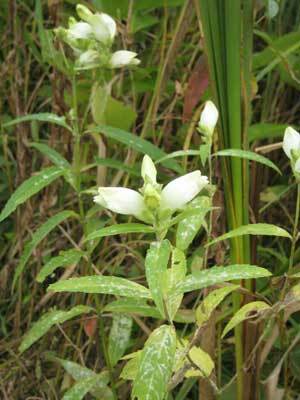 Turtlehead (Chelone glabra) is especially abundant, probably because of the burn. (We had experienced the same result after the 2005 burn.) This very desirable plant (C value of 7) serves as food for the larval stage of the Baltimore checkerspot (Euphydras phaeton), a very desirable butterfly. After the 2005 burn, butterfly folks who visited Pleasant Valley Conservancy reported over 25 Baltimore checkerspots. This year Ann Thering reported seeing 9 on one day. The State of Maryland designated this butterfly as its official insect in 1973. According to the Maryland State web site, this species seems to be declining in its range (much of the eastern United States). The butterfly takes its name from the black and orange checker-like pattern on its wings. These were the colors on the family coat of arms of George Calvert, the first Lord Baltimore, who helped establish the Maryland colony. The Baltimore oriole has similar colors and derives its name from the same source. Our new boardwalk has provided nice access to parts of our wetland, making it lots easier to survey wetland plants. Our long-range plan was always to create a trail from the end of the boardwalk along the creek. We finally found time to work on this trail. Our goal was to be able to "amble" along near the edge of the creek, looking at the plants, and watching the wildlife. This great idea had lots of merit, but ran into a major snag. Amanda and Susan spent most of a morning last week creating the first part of this new trail by cutting the tall weeds with a Stihl brushcutter. I plowed along ahead and marked the route. By staying close to the creek, I was able to trace out a trail that was dry underfoot. This time of year, however, the vegetation is very lush, and I was pushing through head-high (and higher) plants. Back in May when the vegetation was short I had walked this whole area and knew where the dry spots were (close to the creek). This worked out fairly well until we reached a remnant of an old creek bed that still had a bit of water flowing through it. I could jump across here, but we wanted people to be able to "step" across. We had at the barn some long logs that would work fine for this purpose. So yesterday we carried these logs to the spot, in order to bridge this small gap and then get on with further trail mowing. Imagine our surprise when we found that the trail we had so carefully mowed was now completely under water, with a stream flowing through it. Since it had not rained significantly, we knew something was radically wrong. Kathie quickly found the problem: a new beaver dam, constructed just downstream from where our trail was to run. This dam blocked Pleasant Valley Creek, causing it to overflow its bank and pool out into the wetland. Of course, the path of least resistance was the trail we had recently cut. We have had beavers at Pleasant Valley for many years, but recently their dam was a long way from the Creek, by County Highway F, where a small creeklet joins the main creek (East Blue Mounds Creek). That dam had been active for some years, but recently someone had brought in a backhoe and pulled the whole dam out. (Easy to do, since the highway provided a firm footing for the power equipment.) Perhaps it was for that reason, or perhaps these were different beavers, but now we have a substantial beaver dam on Pleasant Valley Creek right in the middle of our wetland. No way to bridge this gap! Someone suggested removing the beaver dam, but past experience has shown that approach to be futile. Beavers can repair any damaged dam within 24 hours. The term "busy as a beaver" is based on reality. Obviously, we need another approach to this problem. 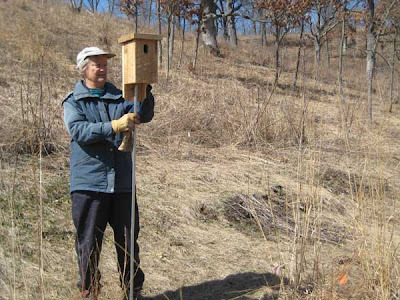 With kind support of Madison Audubon Society, we have set up 11 bluebird houses. Kathie has been monitoring them carefully and has just compiled her report for the year. Bluebirds occupied 9 of the 11 houses, although not all of them fledged young. The first occupancy, in May, was a failure because all the babies were killed in a cold spell. Fortunately, most houses were reoccupied and were successful. The maximum number of babies per box was five, although one had four, another three, and another two babies. House wrens occupied nine of the boxes after the bluebirds were finished, and successfully fledged young. Chickadees occupied a single box after the bluebirds. Oddly, the first chickadee nest resulted in no eggs but instead a dead adult was found in the nest, upside down with her legs in the air. The bluebird boxes are well spaced around the Conservancy, mostly at the edges of open areas (either prairie or savanna). One bluebird house is very near our cabin, where we can watch the activity, especially at lunch time. Of course, we have a lot of bluebirds nesting in tree cavities, so that the houses are presumably just a convenience for those birds that stumble on them. Yesterday we had a unique group of visitors from the UW-Madison Botany Department. It was a delight to have such a knowledgeable group visiting Pleasant Valley Conservancy. I did not get the exact count, but 32 people signed the register. 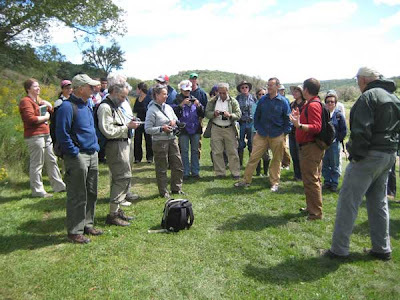 This trip was part of a several day event that Ken Cameron, Professor of Botany, had organized in honor of Hugh Iltis, retired professor and long-time head of the Wisconsin State Herbarium. The main event was the Hugh H. Iltis Lecture in Plant Systematics, given by Scott Mori, a distinguished plant taxonomist from the New York Botanical Garden. His lecture, entitled "Brazil Nut Trees: The Plant Kingdom's Equivalent to Jaguars", was given on Thursday, September 2, 2010. We were pleased that Scott and his wife Carol Gracie, also a botanist, were on the trip. Also present was Tom Givnish, the Henry Allan Gleason Professor of Botany and Environmental Studies, who with his Ph.D. student Mark Leach has published so much outstanding work on oak savannas. The photo above is at the start of the trip, with Ken Cameron (red shirt) making a few introductory remarks and me (right) waiting in the wings. We gave this group the "full tour" of the Conservancy, starting at the Valley Prairie, continuing through the Pocket Prairie and up into the White Oak Savanna, and then up the final hill through the bur oaks to the Far Overlook, which provided an excellent view of the extensive wetland. Then down the Ridge Trail to Kathie's Prairie (the original prairie remnant, that in 1997-98 Kathie restored mostly single-handedly), and finally across the south-facing slope on the Diagonal Trail, and back to the starting point. Because of the frequent and extensive rains we have had this year, the short-grass prairie of the south slope (predominantly little bluestem) was brilliant. There was a stiff wind blowing, and it was a delight to see the waving grass. Never has the south slope looked better! There were, of course, lots of great questions from this knowledgeable group, and Kathie and I were kept busy trying to answer them. One of the highpoints of the trip was the discovery of a new field guide to wildflowers. This book, by Steven Clemants and Carol Gracie, was published by Oxford University Press, and has the best and most extensive set of color flower photographs I have seen. This book, entitled "Wildflowers in the Field and Forest: A Field Guide to the Northeastern United States" (includes southern Wisconsin), has a five star Amazon rating. Trip participant Carol Gracie was the flower photographer, and we were interested to see her photographic skills in action. At the end of the trip, she generously gave us a copy of her book. What a prize! 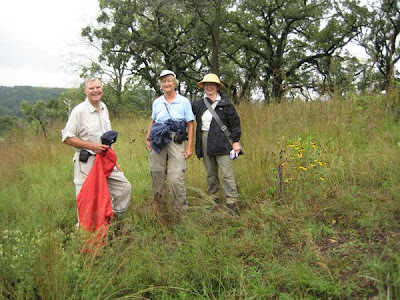 For some years now we have been hearing about the good work that Sibylla and Bob Brown have been doing restoring Timberhill Savanna in southcentral Iowa. We hope someday to make a visit there, but in the meantime the next best thing was to have the Browns visit Pleasant Valley Conservancy. We were able to spend most of the morning with them yesterday on a somewhat drizzly day. A brief history and details of their management program can be found at the Timberhill Savanna web site. At this 200 acre site, the Browns started restoration work in 1993 and did their first prescribed burns in 1995. By now, they have most of the savanna restored, and burn the whole restoration every year, a major accomplishment. "An initial survey of this area, conducted in June of 2003, discovered 206 native species, which was considered impressive for a single meander inventory over one day. In September that year, 59 species were noted during another day in the field; the mean C value for native species stood at 4.4, with an index of 71. It was becoming more than clear that this area was of great significance insofar as its importance as a Midwestern natural area. Another survey, over two days in July of 2004, revealed another 71 native species, with the mean C value remaining at 4.4 and the index now 80. In the interim period, a significant prairie remnant was added to the property, the floristic elements of which are now included within the overall assessment, although many of the newly added taxa came from the timbered tracts as well. As annual fire is continued as a management tool, it is inevitable that future inventories will add numerous additional species." It should be noted that all the species in their list arose spontaneously during restoration and burning. No new species have been brought into the site from other locations. I was interested in the variety of oaks which are present at Timberhill. In addition to the white, bur, black, and red which we have at Pleasant Valley Conservancy, they also have shingle (Quercus imbricaria), and Chinquapin (Q. muhlenbergii), and two hybrids: Bebb's (Quercus X bebbiana) and Hawkins (Quercus X hawkinsiae). We really enjoyed the Brown's visit, and were pleased that they made the long drive from Iowa to visit us!